Try our Chocolate Fountain and please your guests sweet tooth! 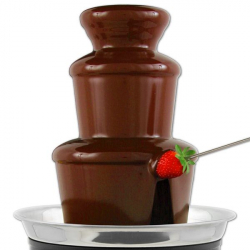 Chocolate Fountains are good for any occasion and are enjoyable by guests of all ages. Wedding receptions always look great with a chocolate fountain in the center of the catering table. This chocolate fountain is for household use only! This item is intended for use indoors only. For ideal operation (4) pounds (64 dry oz) of candy is required. Chocolate is NOT included with this rental. Cocoa Candy Melts, Wilton White Candy Melts can be used. Milk & Semi-Sweet Chocolate or White Chocolate can be used. Rental will come with assembly instructions and cleaning instructions. Failure to clean unit will result in additional fees.